The snow missed us, and there are meetings! With the first major storm of the year becoming somewhat of a bust, and our Winter Bike Fashion Show behind us, we are fully into winter bicycling season. For some, that may mean putting your bike in the basement or on a trainer in the living room to pedal during a Netflix binge. But we hope you will get out there and embrace the season. There are lots of knowledgeable people on our Facebook page to help you stay warm, dry, and safe during the cold, dark months ahead. So let’s take a look at the calendar for the coming week. Bike Fitchburg is having a community open house. Opens at 5:30 pm, program starts at 6:30. Refreshments provided. This meeting is intended to help familiarize municipal planners and elected officials on the Bike Friendly Community application and our work in supporting communities to submit an application in 2019. Fitchburg Public Library, 5530 Lacy Road. Bassett Street Corridor Study Public Involvement Meeting. 7:00-8:30 pm at the Madison Senior Center, 330 W Mifflin St. The city will be rebuilding Bassett St because of some water main problems. But they want to take a look at making some improvements, especially where it intersects with the 400 block of W Wilson St. As the only street connecting Johnson and University directly to John Nolen Dr – and the Lake Monona Path – negotiating the last block of Bassett, the sweep onto Wilson, and the crossing of John Nolen Dr can be a nerve-wrecking experience. This meeting is to discuss goals and objectives of the project. Following very quickly will be a meeting on the alternatives, which will be December 11, also at the Madison Senior Center. Finally for Monday, we have some fun. The MEAThead ride has started up again. A no-drop loop of Lake Monona that leaves from Ford’s Gym every Monday at 7:00 pm from November through March regardless of weather conditions. That’s the way to stay active! Giving Tuesday is the day non-profits remind you to send them some money in the midst of all the holiday spending. While Madison Bikes hasn't made a big Giving Tuesday push, we'd be thrilled if you chose to send us a few bucks. We are an all volunteer organization, but there are still bills to pay, like to keep this website going. We are also trying to do some professional development for our board, so they know best practices for 21st century biking infrastructure. We join national organizations to see what others are doing and bring ideas home. You can donate to Madison Bikes this year and support our work. The Transportation Commission is meeting on Wednesday at 5:00 pm in Room 354 of the City-County Bldg, and there is one item of interest to bicyclists, although it’s not very good news. Because of the state law that prohibits using eminent domain to acquire land needed to build pedestrian and bicycle facilities (we still don’t know who inserted that language into the budget in 2017), there will be a discontinuous path running next to Pleasant View Rd. The TC will receive a presentation on the plans for the road and then approve the geometrics (including the partial path.) If you would like to see the slides, you can access them here. You can also attend the meeting or watch it streaming on your computer. Bus Rapid Transit may not directly be a bicycle issue but we all benefit from improved transit. How the road is allocated and integrating bicycling into the road along with BRT, as well as making sure the stations and vehicles are bike-friendly is important. Roll-on/roll-off bikes on buses, anyone? Level boarding could make that possible, and many cities allow it. The first public meeting about BRT is December 12, 6:00 pm at the Central Library, and there is already a website to learn more about BRT and keep up. The Madison Area Transportation Planning Board (the MPO) will be receiving a presentation on the Fish Hatchery Rd project in Fitchburg at their December 5 meeting. The MPO does have some say over the plans, and they have adopted a Complete Streets policy, so maybe we can get them to make the design better for those traveling along and across the road by foot or bicycle. The meeting will be at the Water Utility Bldg, 119 E Olin Ave, at 6:30 pm. More on that next week. It's a holiday week: On Thursday, many people will celebrate Thanksgiving, and on Friday it's Ho-Chunk Day. So there aren't many other events happening this week. 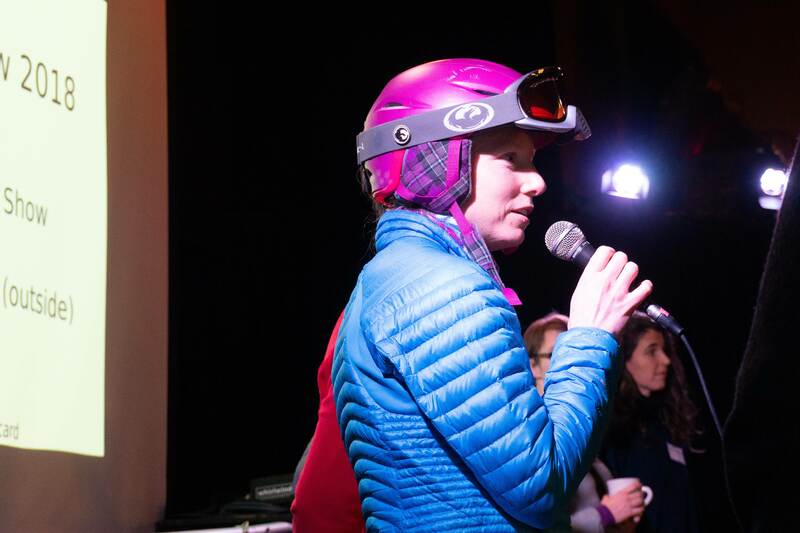 Let's start with a quick recap from Saturday's Winter Bike Fashion Show. About 100 people came to the High Noon Saloon, which I think makes it the biggest show so far! Our MC, Luis "LuckyVoy" Martinez of local LatinX radio station Digital 206, presented our "models," that is Madison area winter riders of all varieties. Models shared their wisdom of how to keep riding in the winter: To wear or not to wear goggles (and how to keep them from fogging up), how to turn a thrift store sweater into leg warmers, how a pair of 1950s army surplus wool pants are the best piece of gear, whether you can use studded tires even when there isn't ice and snow, and many more. Meanwhile in front of the High Noon Saloon, Madison Metro had parked a full-size city bus so that people could practice putting their bike on the bus rack. At the end of the show, some lucky attendees won great door prizes, courtesy of Saris and Planet Bike. Stay tuned for more pictures and maybe some video footage from the event! Thanks to everyone who came to the event, and to the people who made the show happen! A special shout-out goes to Pepe, our events committee chair, who was unfortunately not able to be there on Saturday. While not much is happening this week, Madison Bikes never rests: Our board meets this Monday, and we're excited to get to meet the people who are running for our board of directors. We'll host a speed-dating session with them to get to know them better and give them a chance to learn more about what it means to be on the board of an all-volunteer bike advocacy organization. We're not the only bike advocacy group meeting on Monday: Bike Fitchburg is having their monthly meeting tonight at the Fitchburg Public Library. I imagine there will be some celebrating, as just last week the Fitchburg council approved a budget amendment that allows the construction of shoulders on Whalen Road between Seminole and Mutchler. Bike Fitchburg put a lot of work into making that happen. On Saturday, head to Waterloo for some cyclocross racing: The Battle of Waterloo is starting at 8 am. And on Sunday, Bombay Bicycle Club is hosting their last ride of the season, the "Frezaroo 26." One thing to put on your calendar early: On Monday, November 26 (a week from now), there will be a first public input meeting about the Bassett Street corridor study. It's always good to have some people from the bike community at these meetings. Seven pm at the Madison Senior Center (330 W Mifflin). 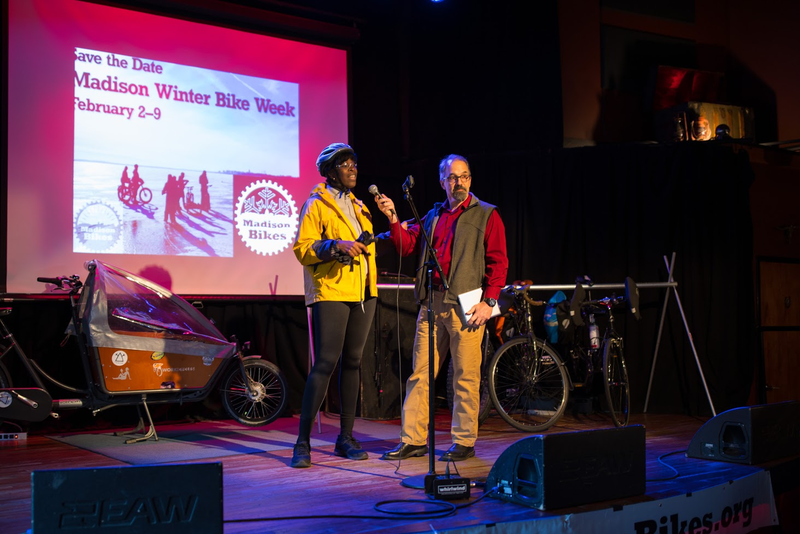 Monday Update: Winter, Bikes, Madison… Madison Bikes Winter Bike Fashion Show! In case you missed it, there was an election on Tuesday. Thank you to everyone who participated in the democratic process. Every vote mattered! Yesterday was also Veteran’s Day. To our veterans, thank you for your service and your sacrifice. Over night on Thursday, Madison had its fist snowfall of 2018! It couldn’t have come at a better time since this Saturday, November 17th, is the Madison Bikes Winter Fashion Show! This ALL AGES event will be at the High Noon Saloon in Madison, Wisconsin from 1:00 PM - 4:00 PM. FREE! Learn about ways you can keep riding in the colder weather months, and come share your winter biking stories! 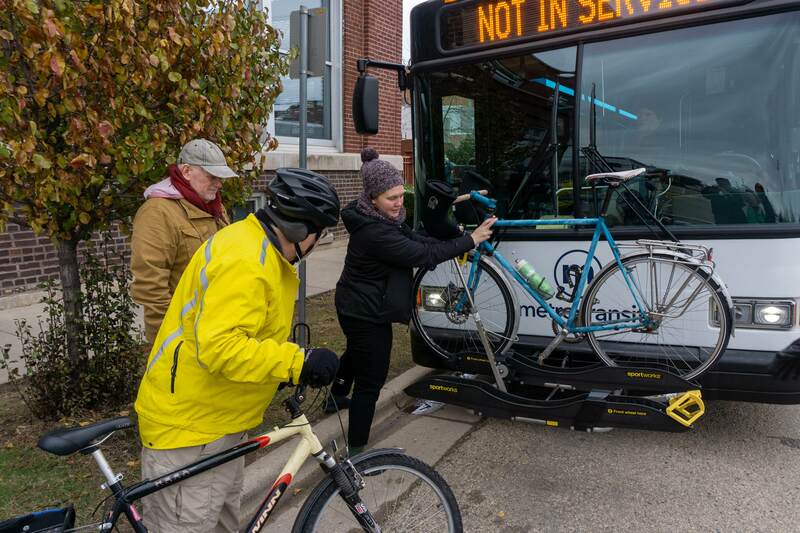 Further reasons to attend: We'll have a Metro bus for you to practice putting your bike on the bus, and we'll have great door prizes courtesy of our supporters Saris and Planet Bike! Sometime over the weekend the repairs to the sinkhole near Wingra Creek were completed and Olin-Turville Court has been reopened to traffic! To those of us who use this route to commute it was fortuitous that a convenient detour was available and many learned of a pedestrian bridge they had not known about previously! In other good trail news: The Cap City Trail is officially open again. And finally, the City of Madison posted a job opportunity for Pedestrian Bicycle Administrator. Read more about that full time position here and spread the word to potential applicants. Today, Monday, November 12, there is a meeting of the City of Madison’s Transportation Policy and Planning Board (TPPB). This board deals with policy surrounding the city’s transportation issues including biking. On this week’s agenda is an update to the Bus Rapid Transit (BRT) plan. Also on the agenda is an item pertinent to winter bike commuters, and that’s on Winter Bike and bike lane usage characteristics. Read the full agenda here. Tuesday, November 13, is the Madison Bikes Communications Committee Meeting. This meeting will start at 5:30 PM at the Stiftskeller in the Memorial Union on Langdon Street. Wednesday, November 14, is the Madison Bikes Advocacy Committee Meeting. This meeting will start at 6:00 PM at Bendyworks located at 106 E Doty St #200. Friday, November 16, is the Capital Off Road Pathfinders (CORP) annual meeting. This meeting will take place at Motorless Motion on West Washington Avenue starting at 5:30 PM. There will be some routine business at the start of the meeting, but after that there will be news of all the work done over the past year and plans for 2019. Food and drink will be provided, and there will be an award given to Volunteer of the Year. Read about the event on Facebook here. Saturday, November 17 is annual Madison Bikes Winter Bike Fashion Show, as mentioned earlier. This all-ages event will take place at the High Noon Saloon starting at 1 PM and going until 4. This is a free event and everyone is invited to come share their winter biking experiences and hopefully learn from others to improve their winter biking experience! Read more about this event here. Before the Winter Bike Fashion Show, join BiciClub Latino de Madison for the Tour de la Familia Latina. ¡Le hacemos frente al frío! This ride will start at 11 AM and end at the High Noon Saloon to join the Winter Bike Fashion Show. Read more about this event here. Also on Saturday is the Mayor’s Neighborhood Conference 2018. Bike Fed Program Director (and Madison Bikes board member) Baltazar will be teaming up with Madison Bike board member Harald to talk about biking and walking, and inequities in Madison. This is an annual conference that brings together community activists to form new connections and to learn about the great things happening throughout the city. Registration is $10 for the day and includes lunch, snacks, and a reception. Fee waivers are provided to City of Madison residents. Read about the event here on the city’s web page, or on their Facebook event page. Sunday, November 18, is Cranksgiving, hosted by Revolution Cycles. This event, which originated in New York City in 1999 is part alley cat, part scavenger hunt, and part food drive. The event starts at 10 AM behind Revolution Cycles on Atwood Avenue. Plan to bring $15 to $30 for food, your bike, a bag, and a lock. Read all about the event here. Please go vote on Tuesday, if you haven't already. You can find more information about polling places and what is on your ballot here. Events committee will be meeting to put the final touches on our Winter Bike Fashion Show 6 pm at Rockhound Brewery. Roll to the polls on Tuesday, Nov. 6 with a free daily pass from Madison BCycle! Promo codes will be posted on all kiosks on Election Day as well as Madison BCycle social media accounts. Communications committee meeting has been moved back to next week so that everyone is able to go vote. Join the City of Fitchburg and project consultants for a presentation and discussion of the preliminary corridor design for the north Fish Hatchery Road reconstruction. The preliminary design will be informed by data and design analysis, and community input to-date. Feedback on the preliminary design will be used to inform the final design, which will be presented in spring 2019. The north Fish Hatchery Road reconstruction is anticipated to begin in late 2019, with the bulk of construction occuring during 2020. This is your chance to hoist 'The Cup'! The Brazen Dropouts are excited to host the 2018 Sun Prairie Cup Cyclocross Race! They'll be bringing another fun, fast, and technical course (perhaps some new features?!). The Nitty Gritty will be on-site cooking up hot food, and there might just be some beer on the hill (for those of age). Additionally, a kids race will be held in the middle of the day. Nov 17, 1:00 pm at the High Noon -- Our Winter Bike Fashion Show is fast approaching. We are looking for volunteers to help with various aspects of the event. And there is still time to apply to be a model for the show. Email Pepe@MadisonBikes.org is you would like to help out or be a model. Although road construction projects may seem to be wrapping up for the year, we now have to keep an eye out for what is going to be built next year. We can't wait until the last minute to make sure there are safe and comfortable facilities for all users, so make sure to take a look at some of the upcoming meetings. Your voice at these early meetings are very important, but we'll keep you posted on what's up. Monday the Transportation Policy and Planning Board meets at 5:00 pm in Room 201 of the City-County Building. Of interest is the Milwaukee Street Special Area Plan. The transportation overview can be found on page 4, with full transportation recommendations starting on page 18. 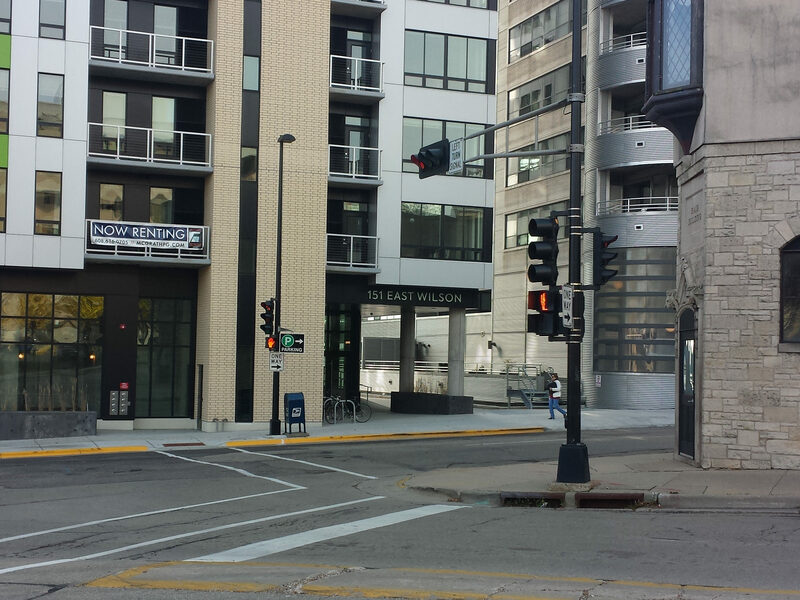 Also on Tuesday, the Madison Bikes Advocacy Committee will meet at 6:00 pm at Bendy Works, 106 E Doty St, 2nd floor. If you want to help us on our strategies to improve the bike infrastructure in Madison, or if you have any other projects you want to work on, come join us. Nov 8, 5:30 pm at Leopold Elementary School, 2602 Post Rd, will be the second community meeting to get public input on the reconstruction of North Fish Hatchery Rd in Fitchburg. This is a chance to tell oth the city of Fitchburg and the County that we need safer facilities for bicyclists on this road. And it would be nice if it was possible to safely and comfortably cross the road by bike or foot, even if it’s just to grab the bus or get going the right way on your bike. Also Nov 8 will be a meeting about plans for Wilson St from Blair to Broom. We worked really hard to try to get eastbound lanes on E Wilson to facilitate access in this corridor. The Board of Public Works and the Council passed plans for the reconstruction of E Wilson without those lanes, but the resolution it include a guarantee that there would be safe and comfortable accommodations for all modes in entire corridor by the time the Judge Doyle Square was opened, including the Bike Center. 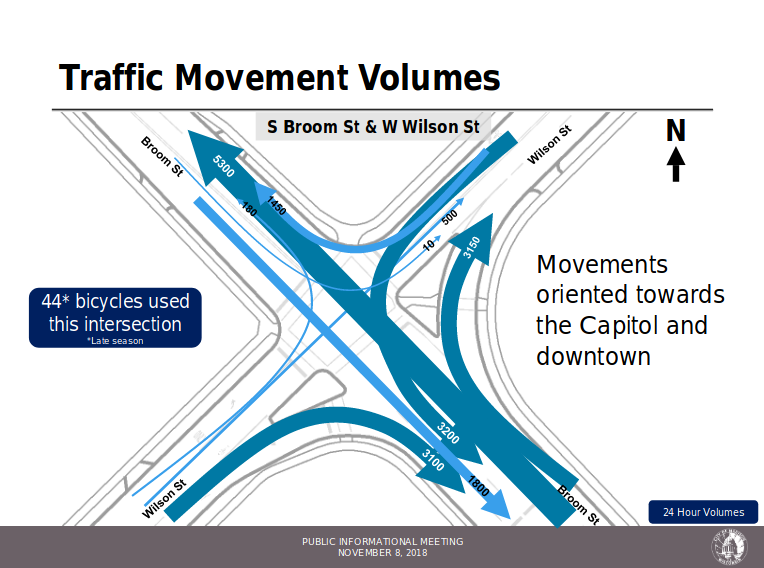 So speak up at this meeting about the need for have two-way bike traffic. I just got back from Cambridge, MA. 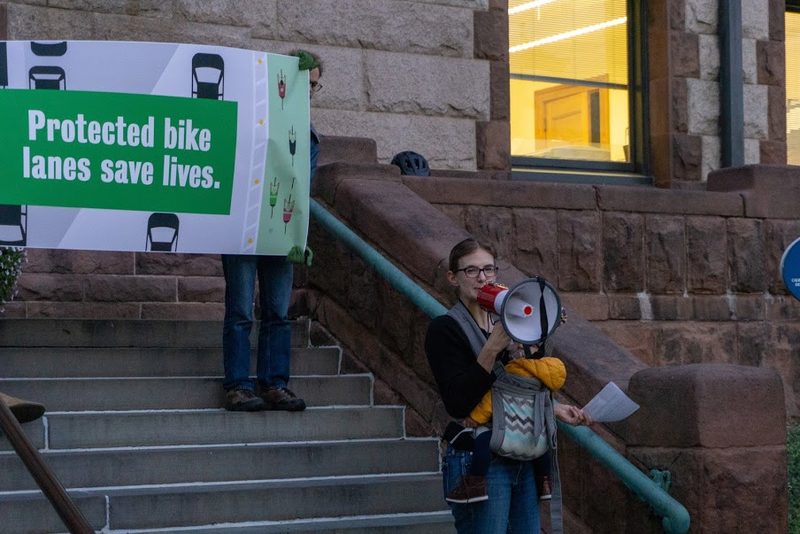 My significant other lives there for the year, and while I was visiting, I had the opportunity to attend a rally for safer bike infrastructure. 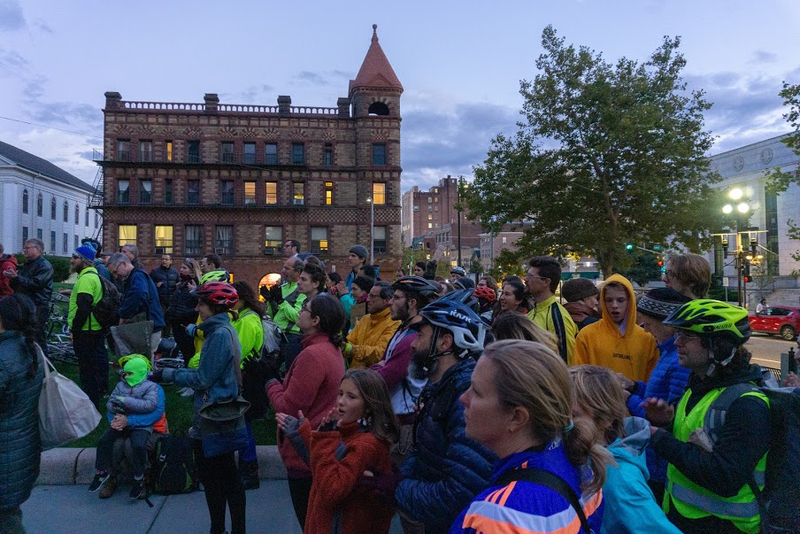 Organized by local bike advocates Cambridge Bicycle Safety, the rally was part of a petition campaign to hold the Cambridge city council accountable to their promise of building a 20 mile network of protected bike lanes by 2023. 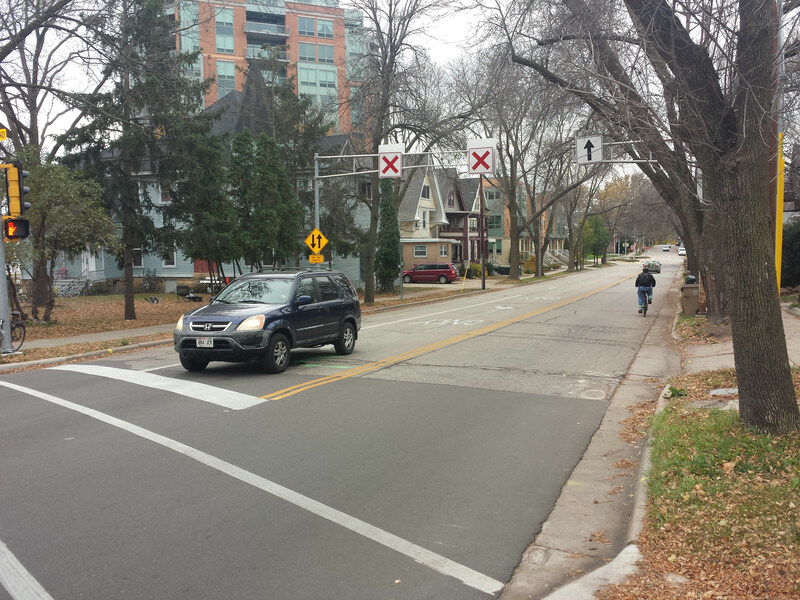 In Madison, we don't even have an official bike plan with measurable goals -- and I think it's showing. I'd be curious to hear what the Madison Bikes community thinks about campaigning on this issue. A quick reminder that you can still apply as a model for the Winter Bike Fashion Show (11/17). Deadline for applications is 11/2. So go ahead and apply, or encourage your friends to be part of this fun event! The week starts out with Bike Fitchburg's monthly meeting on Monday night. I suspect they're going to talk about the Fish Hatchery Road reconstruction. The next public meeting for that project is scheduled for November 8. Based on what I have heard from the previous meeting, there is a real danger that the reconstruction is going to focus primarily on making driving easier, instead of designing a street more amenable to walking, biking, and public transit. So mark the date, or go to the Bike Fitchburg meeting tonight to learn more. 6:30-8:30pm at the Fitchburg Public Library. On Tuesday morning, come to the Capitol Square for a press conference on the release of a report on transportation equity in Wisconsin. The Sierra Club and 1000 Friends of Wisconsin will present the report that "analyzes who is being served and who is left behind by our transportation priorities." You could go to the Transportation Commission meeting at 5pm (City-County Building 351). Two agenda items of interest: An updates on the Bicycle Center at Judge Doyle Square, and an update on the Wilson and Bassett Streets transportation studies. 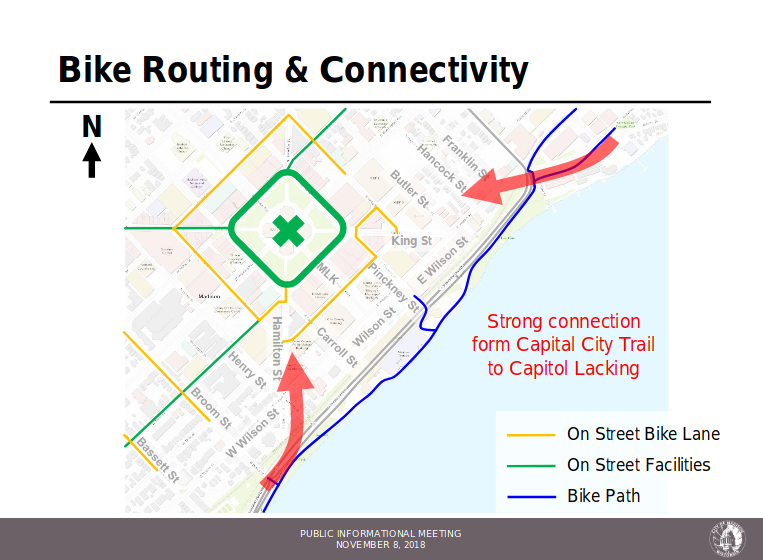 As a reminder, when the city council decided to not include bike infrastructure in the recent reconstruction of West Wilson, they promised to study the corridor and its role in the bike network more comprehensively. Alternatively, you could howl at the moon while riding your bike. Spoke Haven and Bombay Bicycle Club are hosting a Full Moon Ride around Lake Wingra. Meet at 6pm at Westmorland Park. And if you'd rather stay inside and hear about other people's bike adventures, go to the Hawthorne Branch of the library to hear Kent Wegner talk about "Exploring the Former Ottoman Empire by Bike." Starts at 6pm. And on Sunday, you can watch or participate in cyclocross racing at Angell Park in Sun Prairie. The "Cross Fire" races start at 8am. Alternatively, you can support Madison's local radio station WORT by participating in a Day of the Dead Bike ride that takes you from brewery to brewery. Starts at 11am at Parched Eagle Tap Room, and requires a $15 dollar wrist band. The Aberg Ave. Path between Shopko Drive and the Packers Ave. off ramp. Access between Kedzie St. and Shopko Dr. shall be maintained during this work. The Capital City Path between Jackson St. and St. Paul Ave. east of the Goodman Center by Wirth Court Park. Expect to see marked detour signs when this work is being done. Also last week, Yang Tao was announced as Madison’s new City Traffic Engineer. Mr. Tao has served as the Interim City Traffic Engineer since May when the previous City Traffic Engineer retired, and he has served as the Assistant City Traffic engineer since 2016. Mr. Tao is a year-round bike commuter, so his appointment to City Traffic Engineer is widely seen as a good thing for the Madison biking community. His appointment will be submitted to the Common Council this Tuesday and he is expected to be formally hired by the city at the October 30 Common Council meeting. Today, Monday October 15 is the monthly Madison Bikes Board Meeting. The meeting starts at 6:00 PM at the Madison Public Library, Central Branch at 201 W. Mifflin St. The Madison Bikes Advocacy Committee meeting scheduled for Wednesday, October 17 has been CANCELED. It is expected to be rescheduled for sometime next week, so keep an eye out for the rescheduled date. On Saturday, October 20, join the Tour de la Familia Latina, or the Tour of the Latino Family. The ride will depart from its usual location at Olin Park at 1:00 PM. Winter Bike Fashion Show: Be a model! 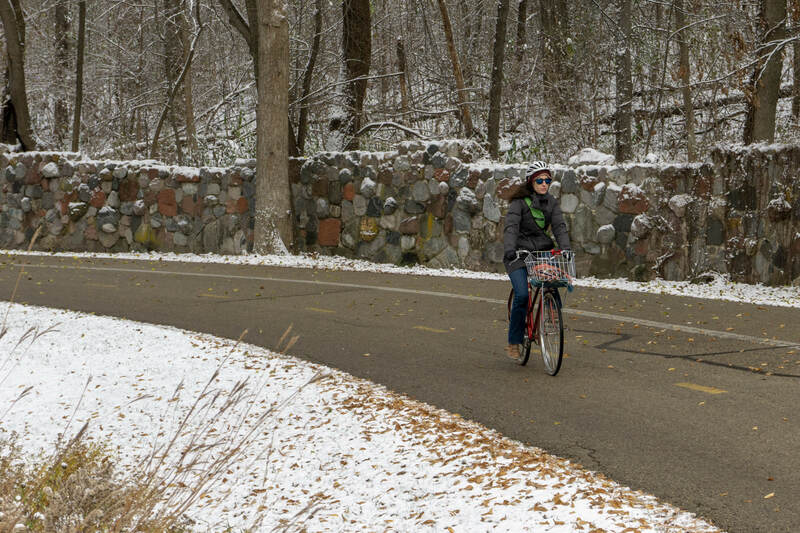 We’re looking for Madison Bikers of all ages who brave the elements and bike into early winter, bike in early spring or even bike year round to share their tips and expertise in dressing for the weather! 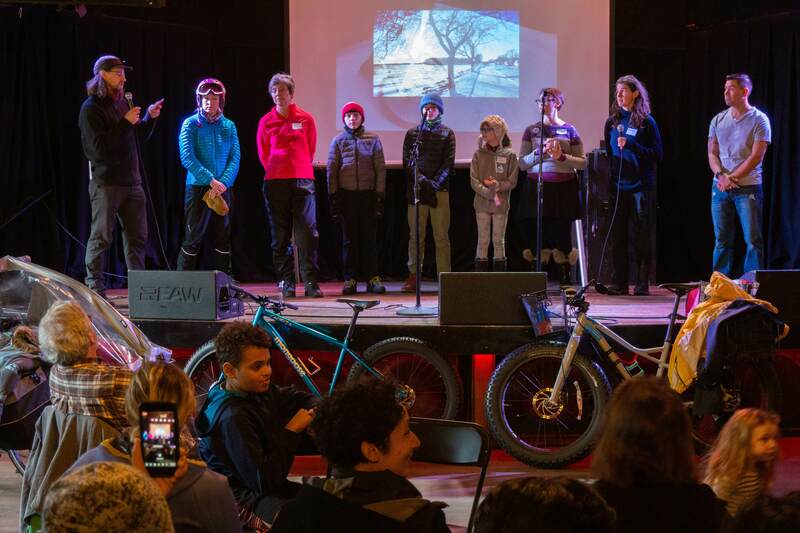 Madison Bikes is excited to host the 2018 edition of the Winter Bike Fashion Show on November 17 from 1-4 pm at the High Noon Saloon. There will be fun, camaraderie, and of course a fashion show highlighting real Madisonians and their winter weather gear. If you’ve discovered a great solution to keeping your hands warm and dry, or have found a way to keep your toes from freezing, we’d love to have you join the fashion show as a model. Do you have a great tip for avoiding fogged up glasses or for keeping your bike lock dry and functional? We’d love to have you! Application deadline: Friday November 2, noon. We encourage you to apply early! If you haven't been to the show before, these pictures showcase some of our previous awesome models! Gear for winter biking and demo bikes- how do you adapt your bike for winter riding? We love DIY solutions that make giving winter bike a try easy and inexpensive! We strongly encourage people of color, women, and LGBTQ+ winter riders to apply! To apply, please complete the following questions and submit to Liz at winterbike@madisonbikes.org, ideally with a picture of you in your biking clothes and/or you with your bike by 11/2, noon. Include a description of your clothing/gear and where/when/why you winter bike. What's your number one tip for people riding in winter? Do you have a winter biking story that may motivate others to ride in winter? What is your favorite thing about riding in winter? Have you been a model for the WBFS before? If so: when? Don't hesitate to apply even if you've modeled in a previous Winter Bike Fashion Show.